It took several years to implement a continuous cycle of assessment, planning, training, exercising and evaluation of IHR core capacities. Preparations started in 2015 with initial assessments and culminated in 2016 with a voluntary joint external evaluation (JEE). JEEs help countries to ensure that they have the right tools, workforce and infrastructure in place to respond and adapt effectively to any threat. JEEs also provide a basis for countries to engage with current and prospective donors and partners to target resources effectively. 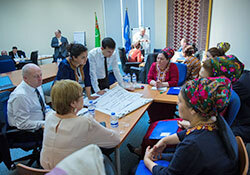 Following the JEE, and upon the request of the Ministry of Health and Medical Industry, WHO experts planned a practical simulation exercise to ensure that Turkmenistan’s health systems are functioning as intended and can be up-scaled as needed. They organized a scoping mission in December 2016 to identify and agree on the purpose, scope and objectives of the simulation exercise, and to develop a programme. After the scoping mission, the expert team agreed that 3 exercises of varying degrees of complexity should be conducted. The first took place in December 2016. The tabletop exercise tested the management of a suspected infectious disease case at the airport and multiple suspected cases within the Olympic Village. The WHO experts also reiterated the JEE recommendations. Among them was the recommendation to develop a national emergency risk communications (ERC) plan that takes an all-hazards approach, including for the AIMAG. Turkmenistan developed and finalized its ERC plan in January 2017. A field exercise and a functional exercise were then conducted in March 2017. The field exercise tested the operational management of a suspected infectious disease case at the Olympic Village, from detection through to admission at a designated hospital in Ashgabat. It included sample testing at the national laboratory. The functional exercise tested coordination and communication processes in the management of the case at the Olympic Village. This included risk communications within and between the Ministry of Health and Medical Industry and the Organizing Committee of the AIMAG.